Granada Studios (also known as Quay Street Studios or the Manchester Studios) were television studios on Quay Street in Manchester with the facility to broadcast live and recorded programmes. They were the headquarters of Granada Television and later ITV Granada between 1956 and 2013. At the time of their closure, the studios were the oldest operating purpose-built television studios in the United Kingdom. Until 2010, the main building, Granada House, had a red neon "Granada TV" sign on the roof, which was a landmark for rail passengers travelling from the west into Manchester city centre. A decorative broadcasting tower was erected at the behest of Sidney Bernstein to give the studios an embellished and professional appearance. At its top, this tower had an enclosed, steerable, microwave dish which, pre-satellite, provided line of sight outside broadcast links to the company's 'Eagle Tower' vehicles. There were three main studios, each covering over 4,500 square feet (420 m2). The studios closed in June 2013, and ITV Granada and ITV Studios moved to dock10, MediaCityUK in Salford Quays and Trafford Quays. Granada House is not a listed building but will nonetheless be retained as part of new proposals by Allied London. This will generally consist of exhibition space and a new bespoke hotel. Although there have been calls to maintain the set for Coronation Street, little appetite exists with local authorities keen to free up new prime city centre land for further commercial development opportunities such as the continuing Spinningfields development. In 2013 the site was sold for £26 million. Much of the site will be demolished, with the exception of Granada House which will be sympathetically retained, reflecting the area's past heritage in television broadcasting, and converted into hotel and office space by 2018. Work started on removing the old equipment from the galleries in February 2018. After Granada secured the contract for broadcasting to the North of England on weekdays, the company built a television studio complex while the BBC Manchester and ABC (originally Granada's weekend counterpart) respectively converted a former church/film studio and cinema in the city for television use. The transition for the other broadcasters was that new areas were required for transmission facilities. Granada bypassed these problems by creating entirely new studios. The studios were designed by Ralph Tubbs, but Sidney Bernstein was instrumental in influencing designs and giving regular plan briefings. Bernstein was believed to have some architectural knowledge despite no experience or formal training, and was referred to as a "genial tyrant" by Granada producer Jeremy Isaacs for his influence in many decisions at Granada. In his memoirs, Forman wrote: "Anyone who witnessed Sidney at work in one of these sessions had to acknowledge his practical genius as an architect" as Bernstein lectured and demonstrated his plans for the studios to colleagues. Forman wrote that Tubbs looked "sometimes enthusiastic, sometimes disconsolate" during Bernstein's lecture briefings. The original studios were in a two-story building on Quay Street. Bernstein stipulated in 1956 the company needed the bare minimum of studio space and was unwilling to invest in facilities that would rarely be used. This was the reason construction took from 1954 to 1962 and the "save money at all costs" mantra was reflective of Sidney Bernstein's business plan. Facilities expanded and a tower block was built next and studios expanded over time. From time to time, as extra production, rehearsal or office space was temporarily required, various adjacent buildings were annexed. These included warehouses on the opposite side of Water Street, the buildings between Quay Street and New Quay Street and the old school premises directly opposite the tower block. In 2002, the studio's reception area was moved from the eastern end of the tower block off Atherton Street, to the western end inside the compound so visitors passed through a secure area before accessing the non-public reception. The old reception area became unused. Granada unveiled plans to move into the bonded warehouse adjacent to Granada House in 2003. One of the four studios would be decommissioned as part of the move, but this plan was postponed as plans for the BBC to move production to Manchester emerged. Asbestos was found at the studios in October 2002, but not removed until spring 2006 costing thousands of pounds. The renovation meant programmes such as Mastermind and An Audience with Coronation Street were moved to The Leeds Studios and The London Studios respectively. In 2006, the 21 acre studio facility employed approximately 1,200 people. After the BBC selected MediaCityUK as its new operating base in Greater Manchester, Granada progressed its £18m move to the bonded warehouse. About 800 office employees moved to the renovated warehouse, leaving 400 employees in the Granada building which houses three studios. The iconic "Granada TV" sign on Manchester skyline, remained in place on the roof and sides of the buildings until September 2010 despite rebranding and the merger between Granada and Carlton. A safety check revealed the signs, that had been in place since the 1950s, were severely corroded and unsafe. They were removed from the penthouse suite in October 2010. Other signs remain on the side of the tower and on either side of the small building on Quay Street. A large ITV logo by the entrance has been placed next to the gate until 2016, when it was removed and replaced with a sign reading 'Old Granada Studios'. By the entrance to the studio tour, the signs have been removed and replaced with the ITV logo, and the Granada name painted over. The company negotiated with Peel Holdings with a view to relocating to Trafford Wharf, next to the Imperial War Museum North and the MediaCityUK development. The proposal meant the outdoor Coronation Street set would need to be relocated, and plans to create a media hub at Quay Street abandoned. The discussions continued for many years but in March 2009, Granada reported that due to the poor financial climate, it would remain at Quay Street "for the foreseeable future". Talks resumed in January 2010 after a change of management at ITV plc and Granada announced on 16 December 2010 that it would move production and ancillary staff to the Orange Building in the MediaCityUK complex to produce Granada Reports and production of Coronation Street would take place at a facility across the Manchester Ship Canal in Trafford Park on Trafford Wharf. The new facility, which opened in early 2014, has two large studios with production units, set storage, dressing rooms, space for interior sets and a new outdoor set. It appears likely that the Quay Street site will be sold for development dependent on Manchester City Council's agreement as the council owns land on the site. It would be a prime redevelopment site regardless of the studios' historical importance. A 2003 article in The Daily Telegraph estimated the plot of land on which the Granada House building stands could sell for £15m, a speculative figure considering the economic situation in 2011. Four of the studios on site are due to be reopened by a new firm, Allied London, apparently under the name of ALL Studios. The four studios which are part of the main complex, Studios 2, 6, 8 & 12, are due to be retained, with Studio 4 having been demolished as of January 2019. It will incorporate part of the Enterprise City project, which will also include co-working facilities, an Everyman cinema and a Soho House hotel. The studio complex comprised the original building and office block accessible from Quay Street, with other studios around the complex. Granada's studios were originally all numbered evenly to falsely embellish the size of the complex and make Granada Television appear to be a large broadcaster. Granada Studios main studios – Studios 2, 6, 8 and 12 – were housed in Granada House, and it is these which have been retained as of January 2019. Studio 2 – A 3,218 square feet (299.0 m2) studio, formerly home to Granada Reports and the northern operations of ITV News (among the first operations to move to dock10, MediaCityUK, on 25 March 2013). Retained for ALL Studios. Studio 4 – One of the original studios created as part of the first phase TVC building, later taken out of service and then part of the reception. Demolished as part of the 2018 renovation works. The Beatles' first TV performance was broadcast from this studio in October 1962. Studio 6 – A compact studio measuring 4,456 square feet (414.0 m2). It was intended to be mothballed to reduce maintenance costs in 2003, but was reprieved after programme production increased (largely due to becoming home to The Jeremy Kyle Show). Retained for ALL Studios. Studio 8 – A medium-sized studio measuring 5,447 square feet (506.0 m2) with a capacity of 240, historically has been used for filming quiz shows such as University Challenge. Retained for ALL Studios. Studio 10 – Not in the studio complex, Studio 10 was at the Chelsea Palace Theatre, London and used for interviews and filming acts outside Manchester. It was sold by Granada in the 1960s and demolished in 1966. Studio 12 – A large studio measuring 7,922 square feet (736.0 m2) with a capacity of 524 is used for entertainment shows. The studio hosted the First Election Debate in 2010. Retained for ALL Studios. In addition to the original studios, there are other studios located around the complex. The Breeze Gardens Studio was located in the garden, south of the tower, and is 477m² and was used for interview based programmes or press shoots. This is now a marketing suite for the St. John's complex. The adjacent Bonded Warehouse was used for many years as offices and television production facilities. Post production facilities were located in the tower block as were green rooms and other guest facilities. 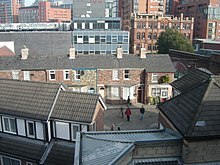 The site contains the former set of Coronation Street on the south of the site, and the Bonded Warehouse on the south west. Situated across Grape Street from the main studio building and adjacent to the Bonded Warehouse is the former Coronation Street set. This version of the set was first created in 1982, but was replaced in January 2014 by a new set at ITV's new facility in Trafford Wharf Road. This was mostly demolished to make way for outdoor filming and parking for production vehicles in early 2018. ^ "BBC – Venue – 3sixtymedia". BBC. Retrieved 2011-10-19. ^ "BBC Resources merges with Granada Media". The Guardian. 2 August 2000. Retrieved 2011-10-20. The new company, called 3sixtymedia, will be 20% owned by the BBC and 80% by Granada. ^ "5 Granada Television Quay Street". masaimedia.co.uk. 20 June 2011. ^ "Iconic Setting For First TV Debate". Sky News. 15 April 2010. Retrieved 2012-02-11. ^ "ITV takes down famous Granada TV sign". Digital Spy. 27 September 2010. ^ "Granada moving, but only next door". Manchester Evening News. 19 November 2003. ^ "Granada TV Building, Manchester". February 2005. ^ "Plan to preserve Coronation Street's famous cobbles". Manchester Evening News. 17 December 2010. Retrieved 31 July 2011. ^ "Granada site deal signed". ITV News. 27 September 2013. Retrieved 2016-03-27. ^ "Manchester City Council – ITV /Quay St Regeneration Framework" (PDF). Manchester City Council. 14 March 2012. Retrieved 2012-03-09. ^ "Manchester Grande". Levitt Bernstein. Retrieved 2016-06-18. ^ Forman, Denis (1997). Persona Granada. Andre Deutsch. p. 53. ^ a b c "Granada's Founding Father". teletronic.co.uk. Archived from the original on 28 July 2011. Retrieved 27 July 2011. ^ "Nightmare on Corrie". The Sun. 9 May 2009. ^ a b "Granada Television". screenonline.org. Retrieved 2011-10-19. Architect Ralph Tubbs, who had designed the Dome of Discovery for the Festival of Britain, was called in and was given a comprehensive brief during ongoing planning sessions by Sidney Bernstein, who had quite an ability as an architect. ^ "Bernstein – genial tyrant of Granada: Jeremy Isaacs recalls his former boss and founder of the Granada group, who died at 94". The Independent. 7 February 1993. Retrieved 11 February 2012. ^ "Television Gets A Complex". transdiffusion.org. 28 January 2009. ^ Moyes, Jojo (2 August 2000). "BBC joins forces with Granada to make TV shows". The Independent. Retrieved 2011-10-19. ^ "So long, New Broadcasting House". transdiffusion.org. 3 December 2011. Retrieved 2012-02-01. ^ Wylie, Ian (11 January 2006). "Historic move for Granada TV". Manchester Evening News. Retrieved 27 June 2011. ^ a b c d "Granada moving, but only next door". Manchester Evening News. 19 November 2003. Retrieved 2011-10-11. ^ a b "TV studio asbestos clean-up". The People. 7 May 2006. Retrieved 6 August 2011. ^ "ITV steps up relocation plans". The Guardian. 11 January 2006. Retrieved 11 October 2011. ^ "Historic move for Granada TV". Manchester Evening News. 11 January 2006. Retrieved 2011-10-11. ^ "Granada moving, but only next door". Manchester Evening News. 19 November 2003. The switch would spell the end for the iconic building on Quay Street which supporters see as a symbol of the company's proud regional ethos but insiders say is a "1960s nightmare". ^ "North-west business awards: 'We'll keep Granada in Manchester'". Daily Telegraph. 8 December 2003. Retrieved 2011-10-11. ^ "'Coronation Street' set to become English Heritage site?". Digital Spy. 5 February 2012. Retrieved 2012-02-05. ^ "Old Granada Studios". Allied London. Retrieved 20 January 2019. ^ Chapman, Stephen (9 March 2017). "Granada's historic studios will produce entertainment shows again". Prolific North. Retrieved 20 January 2019. ^ "New lease of life for Old Granada Studios". Insider Media Ltd. Retrieved 20 January 2019. ^ "All Venues". Old Granada Studios. Retrieved 20 January 2019. ^ Bickerton, Jake (4 July 2018). "Former Granada Studios to reopen as TV and film space". Broadcast. Retrieved 20 January 2019. ^ Jackson, Daisy (28 November 2018). "A boutique cinema where you can hire a sofa is coming to Manchester". Manchester Evening News. Retrieved 20 January 2019. ^ Clarence-Smith, Louisa (29 October 2018). "Goodbye, hello: a new episode for Granada's famous studios". The Times. Retrieved 20 January 2019. ^ Whalley, Mike (27 June 2011). "Smooth operator: New Manchester City executive John Williams in profile". Manchester Evening News. Retrieved 28 June 2011. ^ "Remembered: Granada Studios Tour". G Force magazine. 15 October 2010. Archived from the original on 9 December 2011. ^ a b "Granada studio tours to end". BBC News. 18 January 2001. Retrieved 28 June 2011. ^ "3SixtyMedia: Virtual Tour". manchester-studio-tv. Retrieved 2011-10-19. ^ "Chelsea Palace Theatre". tvstudiohistory.co.uk. Archived from the original on 17 July 2011. Retrieved 4 July 2011. ^ "Chelsea Palace Theatre in London, GB". cinematreasures.org. Retrieved 20 January 2019. ^ "3SixtyMedia Studios – Technical Specification" (PDF). the-manchester-studios.tv. Retrieved 2011-10-19. This page was last edited on 18 February 2019, at 21:33 (UTC).